Kitty-AF – Blogging my way through my FdA. Blogging my way through my FdA. The Materials and Objects exhibition at the Tate Modern covers such a vast range of ideas, media and artists that it takes a while to really take it in. Below I have selected some of the pieces that really caught my attention. They’re by no means an exhaustive look and it is really worth taking an afternoon to go and look. This is cheating slightly as it is on the wall before you go into the Boiler House. There are few things more visually appealing to me than a clean, rounded font lit in white, so it’s not surprising that I picked this, but I also like the fact it is tautological – an equation that can never be solved, and also that you can’t say for sure whether it is a positive or negative statement! It was commissioned for the Tate in 2000 to mark the change from The Tate Gallery of British Art to Tate Britain. You can read more about it on the Tate Modern website. I think its apparant that I’m a bit of a magpie. In the case of Ink Spalsh II by El Anatsui, however, it was the vivid blue that attracted me rather than the gold. I especially like how dark it looks in the folds of the piece, which was made by weaving strips of aluminium bottle tops. These were then attached to each other using copper wire to create a metallic tapestry. 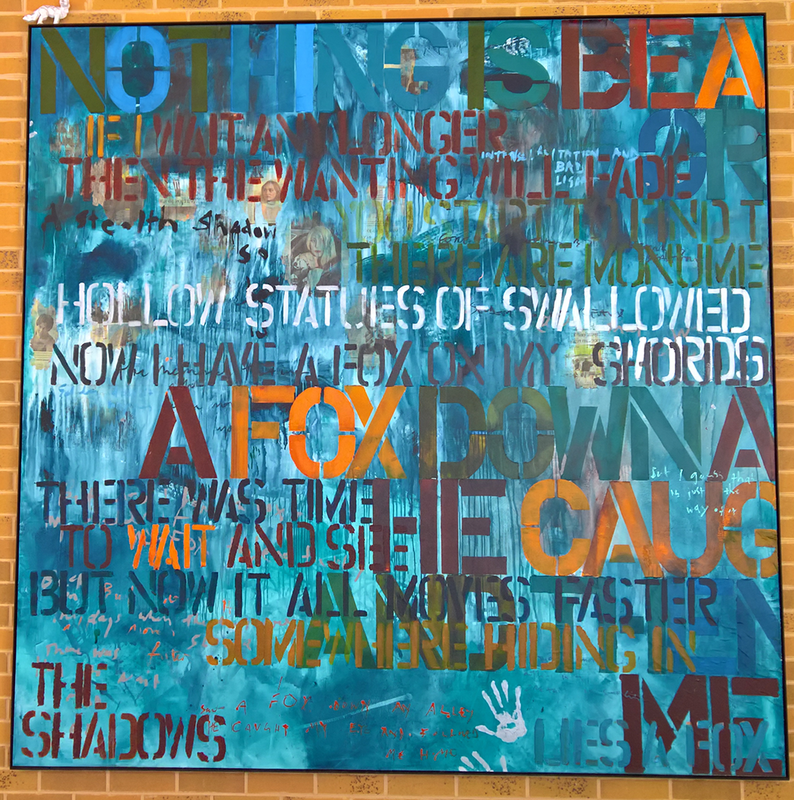 As you can see from the photo on the Tate’s Website, the colour escapes the established boundaries of the piece by spilling over from the wall onto the floor. Behold by Sheela Gowda is a striking piece to look at, and that is before you realise it is constructed using human hair. The hair has been knotted and forms 4 kilometres of rope, which is then wrapped round and hung from twenty car bumpers, knotted further into netting, hung from the ceiling and pooled in coils on the floor. The work reflects superstition in the place Gowda lives; it is common for people to knot their hair around car bumpers to ensure safety from bad luck and accidents. Tate Modern page on Behold. The final artwork I have picked out from my trip is Embryology by Magdalena Abakanowicz. It takes up a large room by itself; being arranged in two different mounds – one long and the focal point of the room, and another piled up in the corner. To me, the stuffed burlap sacks are reminiscent of the rocks and stones on a beach, but on closer inspection the texture of the hessian suggests something softer and more obliging. Popping in with a late-Friday night post (never let it be said that I don’t know how to party!) showing the end results of the reduction linocut I created on Tuesday. The basis for my design was the set of mark making ink drawings I did just before half term. They were created using everything from the end of my metal ruler, the tines of a fork, paintbrushes, a macron fineliner and my fingers. 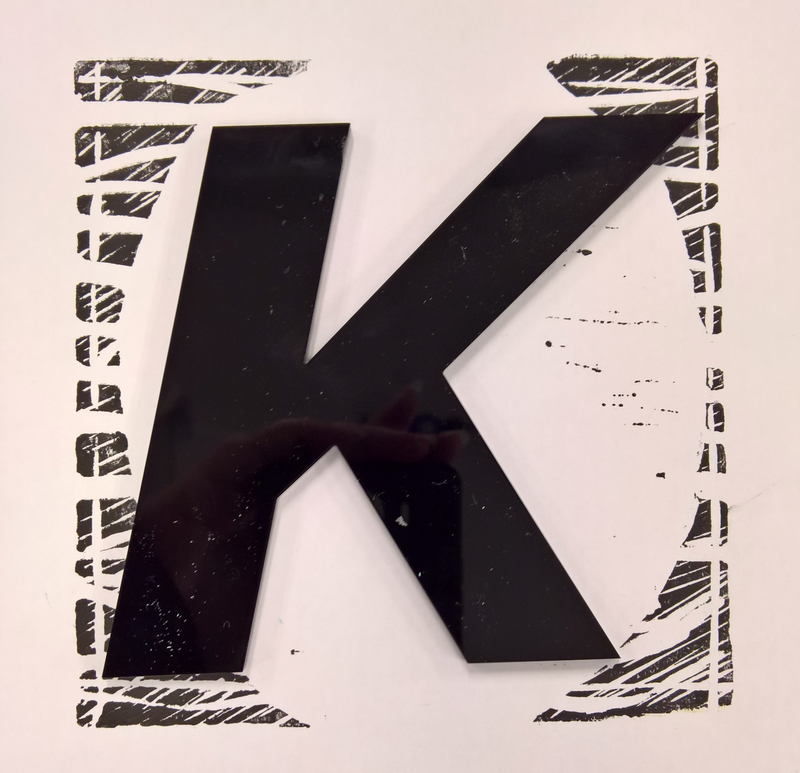 The first thing I did was transfer the basic ‘K’ shape onto a piece of lino by covering a photocopy of it in whiting an drawing on the back of it. I then traced over the chalk outline with a biro to give myself a clear outline to work with. My two favourite prints from this lino. 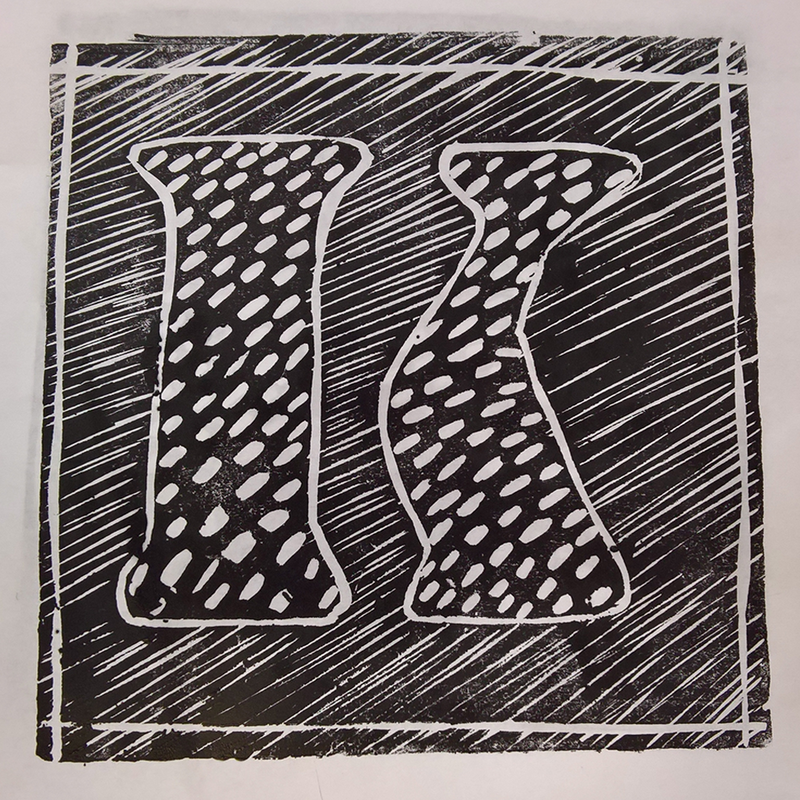 In a reduction linocut, you create each layer of the print by carving away more lino from the same block. For this reason it is a good idea to make sure you make lots of prints of each layer, as you can’t go back and reprint previous layers. For each layer I kept one print of it at that point, and did one of each carving in black. I used these to create the gifs below. The progress of my reduction linocut, black and white prints. To design each layer, I chose a different mark-making texture from my original sheet and tried to replicate it using my linocutting tools. There was an increase in detail with the first four prints, but then I had gone as far as I could with adding detail and so to get the last two prints I had to remove detail by cutting it out. The last cut I made removed most of the detail that was left in the lino. It looks far more effective in the colour print than on the black and white one. Lining up each overprint was a bit of trial and error; it’s quite hard to line up the detail such as the rouge frame I did, when you can only see the edges, especially as once I’d warmed up the lino on the hot plate to carve it more easily it then bowed in the middle when I was trying to place it! Some prints were more successful with being aligned properly than others. 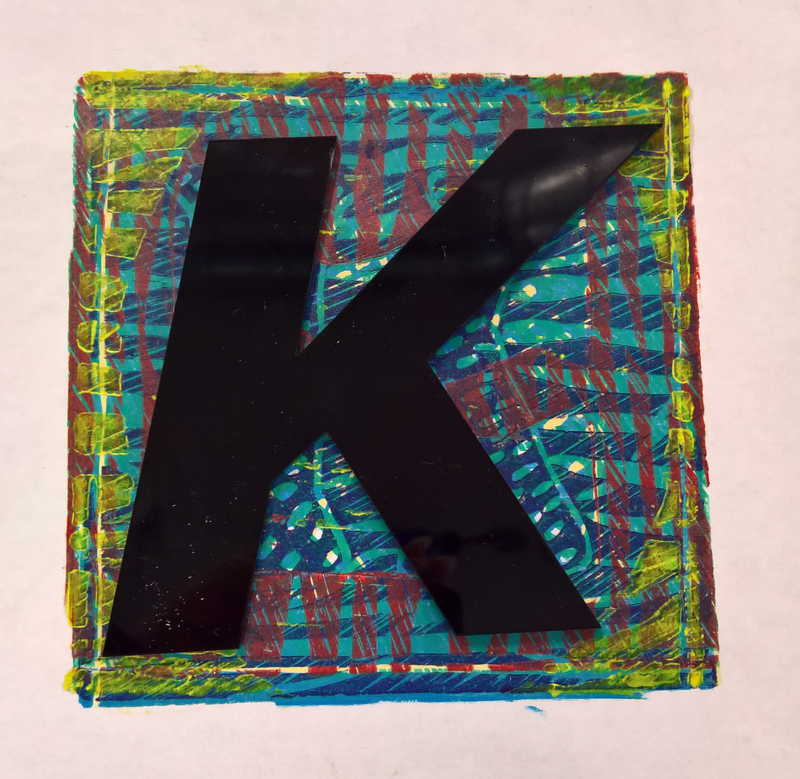 I did an experimental colour print which you can see behind the acrylic laser cut ‘K’ above. Instead of printing each one exactly over the previous one, I rotated it by 90 degrees each time. This allowed the colours and patterns to play with each other in a different way. Colour choice wasn’t something I planned with this piece. I chose the next colour each time by looking at the combined effect of the previous colours and picking what I thought would look nice over it, with little thought. I think in hindsight, a more subtle yellow colour would have worked better as the final one, or perhaps even black, just to frame it. I think that in future it would be good to do an additional print that is varying tones of the same colour too. As a newly minted as an HE student who has never visited the Tate Modern before, I hopped on a train and headed down to London to visit the iconic gallery. There were a lot of interesting sights and things of note before we’d even got as far as the Southbank, so I would like to share those with you. Travelling across London on the Tube exposes you to a huge wealth of design history; from the signage and decoration of the stations to the textile designs (known as a ‘moquette’). The current moquette is called ‘Barman’ and features key buildings from London’s skyline, including the London Eye. Can you spot the others? The fabric has been used on underground trains, starting with the central line in 2011. You can read an interview with the designers Wallace-Sewell here. The fourth plinth on Trafalgar Square was shrouded in wrapping when we were there but a few days later David Shrigley who, incidentally has recently done a collaboration with Tiger on everything from plectrums to a rather nice bag (that I think pretty much everyone in the Art building now owns!) had a sculpture called ‘Really Good’ unveiled. I better find some other superlatives to describe my feelings for it; safe to say I love the positivity of its message and how the super elongated thumb echoes the height of Nelson’s Column. 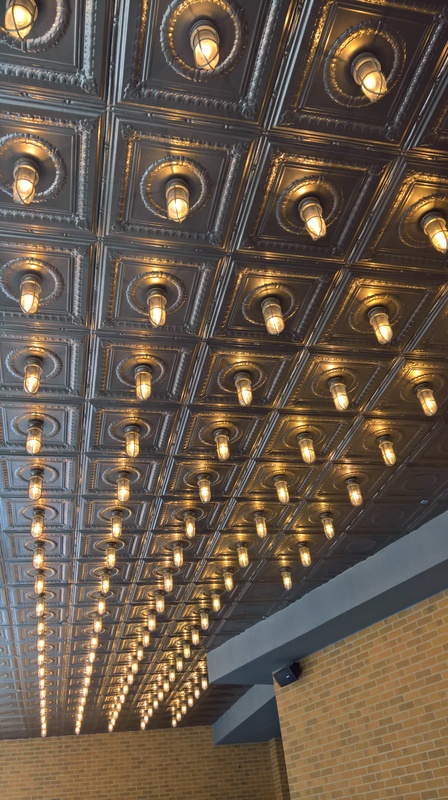 Another interesting spot was on the outside of the Hilton London Bankside, a juxtaposition of exposed filament bulbs and tin ceiling tiles with a diptych by Niki Hare. 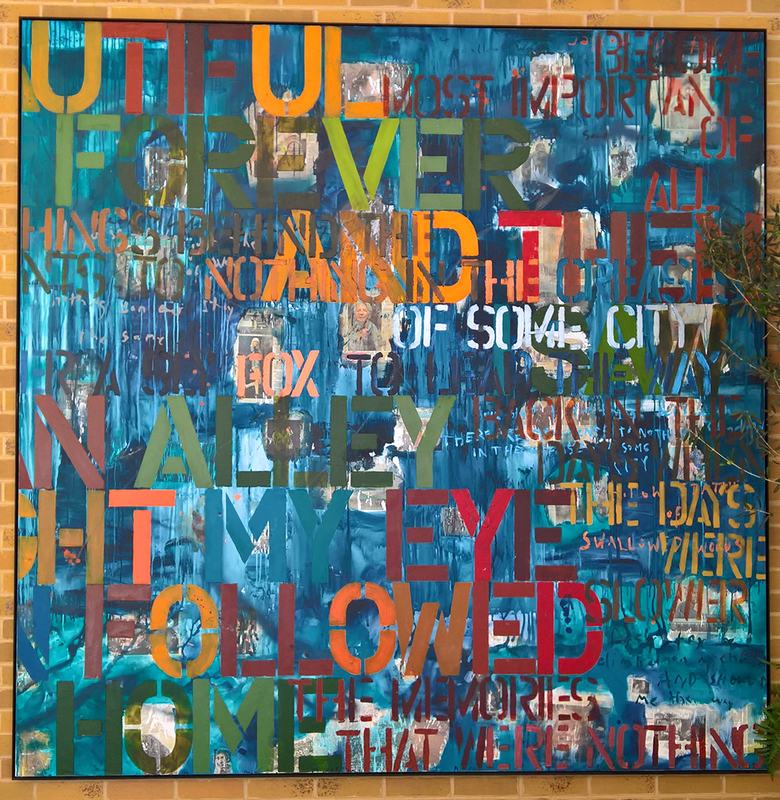 I am always drawn to strong blues and teals, but where this work really shines, for me is with the orange and yellow ochre letters, they stand out beautifully to my eyes. The tin tiles and filament bulbs feel historical in a carefully curated way; that sort of bulb is increasingly popular at the moment, which I think is a response to how displeasing energy saving bulbs are to the eye; these bulbs have a warmth and understated feel softens the harshness of a fairly modern building. There is something entrancing about the smooth, carefully hewn features combined with the natural, rocky outcrop that is hidden behind the face. You can explore more of Young’s work on the Bowman Sculpture Catalogue website and on her own gallery page on her website. Next time I will be writing about the Louise Bourgeois Artist’s Room and the Materials and Objects exhibition at the Tate. At the start of our course, we visited the Tate Modern in London. I’d not been before so I wasn’t sure what to expect! One of the beautiful things about the Tate Modern is that they work with the fabric of the building. All around it you can see hints to its past life as Battersea Power Station. Our first stop at the Tate was to head down to the Tank Room to experience the Active Sculpture exhibition. This is a BMW sponsored exhibition comprising of three interactive pieces from the 1960’s as well as a new piece by Tarek Atoui. A different view of the sculpture, taken whilst crouching down. As per the artist’s instruction the piece is periodically rearranged, and had been the Friday before our visit. The idea is that there are an infinite amount of combinations it can be arranged into. It is important to Araeen that the symmetry of the piece is occasionally broken by this process of rearrangement. The size of the tank room belies the vastness of this piece, and from different angles, like the one above, it appears infinite in an entirely different way. This interaction between the viewer and the piece is part of Morris’ aim, as along with other spectators moving past, the involvement of a person changes the way the sculpture appears and is perceived by everyone who is looking at that moment. I enjoyed experimenting with where I stood in order to make myself vanish, which is quite a surreal experience when you are expecting to see your reflection. There were also a work by Charlotte Posenenske ‘Revolving Vane’ (1987) These were painted particle board cubes that can be rearranged by opening and closing different doors, to make different rooms. After leaving the Tank Room, we took a quite detour into the room next door which was full of screens showing the work of Apichatpong Weerasethakul’s ‘Primitive 2009’. Whilst it was quite an overwhelming experience, the effect of multiple layers of sound and film was interesting, especially the way that by manipulating media you can create an entirely different narrative to the simple one that was filmed; in this instance films of a small border town into a ghost story. We visited one of the Artist’s Rooms and the Materials and Objects exhibition in the Boiler House after we had finished in the Tank Room, which I will tackle in separate posts. This morning, we had a workshop in rubber stamping led by Stephen Fowler. Stephen is an Illustrator (Harrow, Central St Martins) who, after a decade spent working freelance for clients such as the Independent, chose to specialise in rubber stamp art. 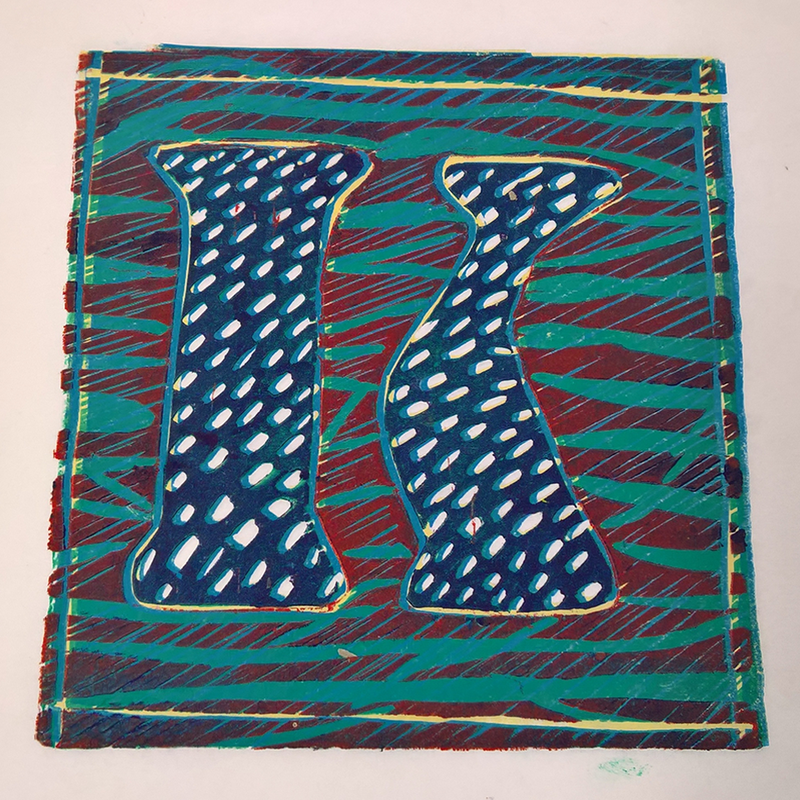 He has recently released a book on this subject entitled ‘Rubber Stamping: Get creative with stamps, rollers and other printmaking techniques’ [Lawrence King]. As well as running workshops, he exhibits at places such as Turner Contemporary (Margate) and creates Art books. The rubber stamps are created from rubber erasers; Stephen explained that the limitations of size mean you have to get creative with them. 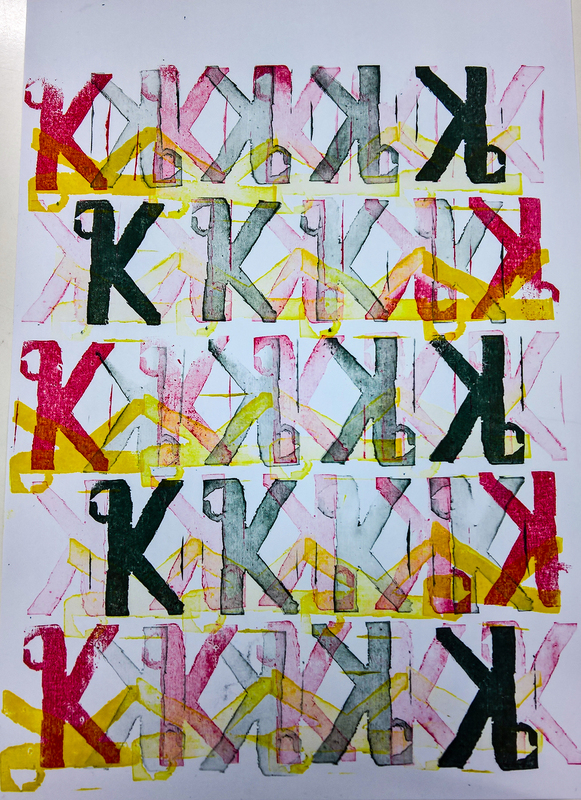 It is better when starting out to use simplistic designs, so I chose my initial ‘K’. I chose to add a little flourish in order to give myself something slightly more complex than straight lines to carve out. The design was filled in with a 2B pencil, and then the rubber was placed over it, and both the paper and the rubber flipped. I then rubbed over the back of the paper with a pencil which transferred the image to the rubber. At this point it looks like it’s the wrong way round, but because you then apply the stamp to the paper, when you print it will be the correct way round. If you were to draw the design directly onto the stamp then you would need to draw it the opposite way round to your intended outcome. Cutting away the unwanted parts with a scalpel. Whilst it is possible to use the same sort of tools you would use to cut lino, Stephen had us use a scalpel knife. Using the blade ensures greater control and makes it easier to prevent accidental cuts into the area under the stamp, which would affect the quality of the stamp. Cutting through the rubber with a scalpel was not as easy as Stephen made it look! 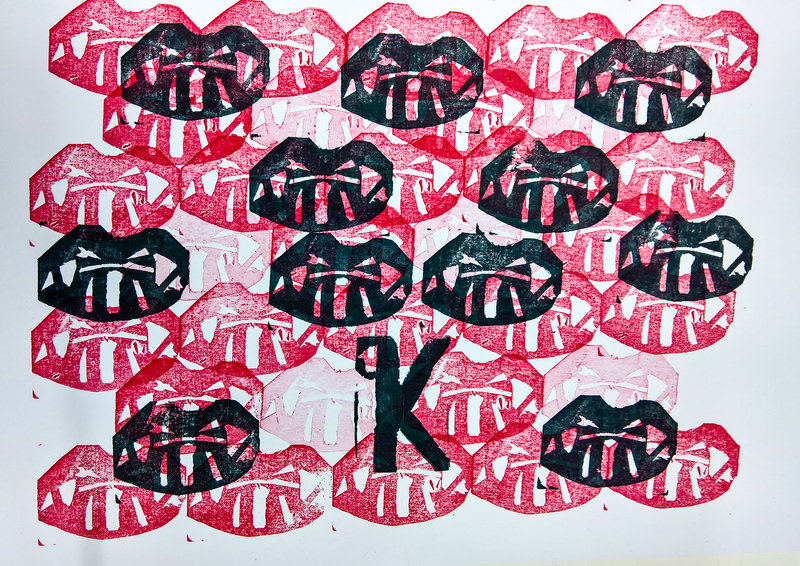 It is a very different feel to using lino, but I think I had got the hang of it better with the second stamp! The first cut you make should be against the line of the design with the scalpel held in your hand as you would a pencil, and then you create a ‘v’ shaped notch by turning it around and returning along the outline with the blade angled towards the bottom of your original cut. To remove edges you can slice through horizontally until you meet the edge of your pattern. It is important to remember that you can’t undo the removal of the rubber, so it is best to make sure you are cutting the right bit before you start to cut. For the second stamp, we were each asked to write a word on a piece of paper, and then to pick one of them to inspire us with a design. I pulled out ‘pointy’ and after an unsuccessful attempt at drawing a mace, I went with something holiday-appropriate; vampire teeth. My designs from the day. To ink them we used ink pads. This is part of what makes Rubber Stamping a really accessible way of creating art; it’s something you can easily do at home with little financial outlay, you can pick up ink pads and erasers on the high street for as little as £1 (Tiger is grrrrreat! for things like this) and then all you need is a scalpel/craft knife and some paper. Stephen also gave a talk to us in the morning before the workshop, and showed us some of his work, and there are just so many places you can take stamps due to the simplicity. My scalpel set was purchased from The Artery. I look forward to experimenting further with creating stamps, I especially like the idea of creating mix and match ones and a set of custom type ones. Keep your eyes tuned on my Portfolio page over the next couple of months to see what I create! You can purchase Stephen’s book on Rubber Stamping here, and find his blog here.